The index opened flat and oscillated within a narrow range to close weak below the psychological level 7600 at 7597.00, loss of 18.10 points. The broader market was weak with 623 advances to 942 declines. The range till expiry is 7400-7700. 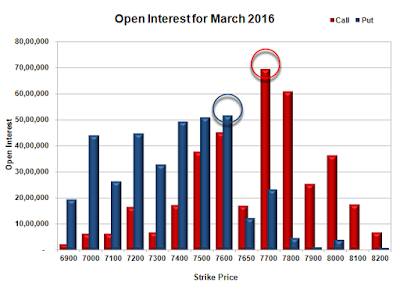 Call option 7600-7700 added huge 12.89 lacs OI with profit booking seen at 7800 and above strike prices. Put option 7650-7400 added 10.77 lacs OI with short covering seen at 7700 and above strike prices. Nifty Open Interest is at 1,60,52,700 down by 26,94,750, whereas Apr series added 47.54 lacs with decrease in price, 100% roll-over with huge short build-up. Bank Nifty Open Interest is at 15,40,050 down by 4,70,940, whereas Apr series added 4.54 lacs with increase in price, mostly roll-over with small short covering. FII’s bought 0.99 lacs Futures, which includes net 30324 contracts long build-up and 26356 contracts short build-up, with increase in net OI by 56680 contracts, includes 154024 longs to 150056 shorts for the day. 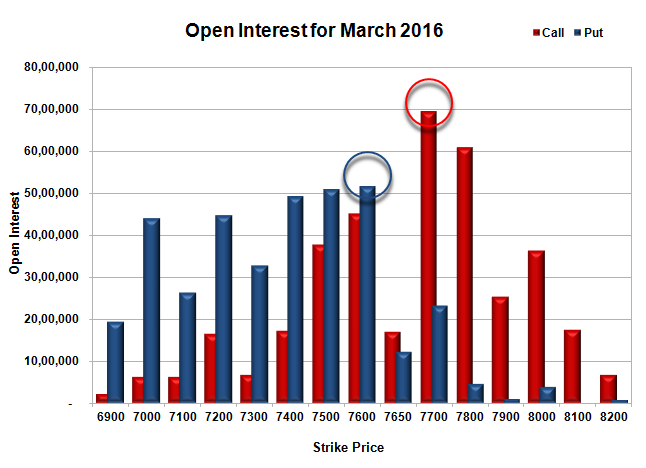 FII’s Index future open contract as on date is 243180 Longs to 140777 Shorts, Net 102403 up by 3968 contracts. 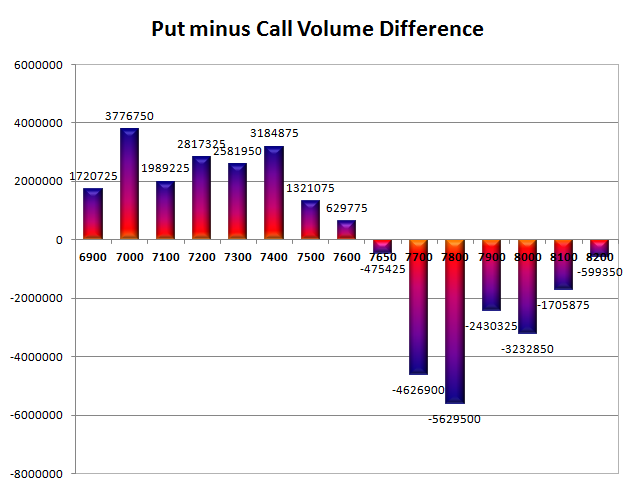 Initial and best support stays at 7600, with OI of 51.58 lacs and below that at 7500 with OI of 50.97 lacs. 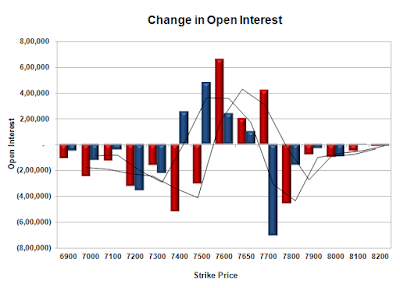 Initial resistance at 7650, with huge OI addition of 2.01 lacs and above that at 7700 with highest OI of 69.47 lacs. Day Range as per Option Table is 7533 - 7680 and as per VIX is 7527 - 7667 with 7611 as the Pivot.